All transactions are safe and secure with a reliable history in online purchasing behind each of our associates. 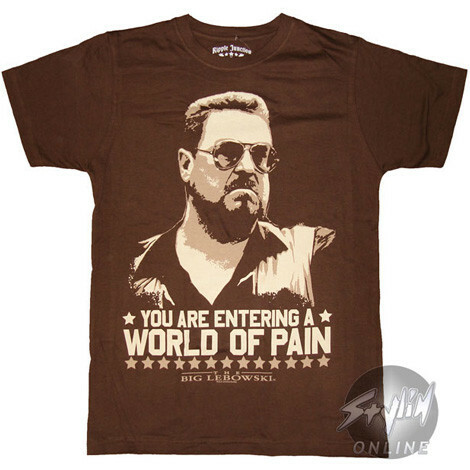 Buy the You are Entering a World of Pain t-shirt to own Big Lebowski clothing and merchandise. The front of this chocolate colored tee features the Walter Sobchak (John Goodman) quote from the Big Lebowski, "You are entering a world of pain." An image of Walter is visible above the memorable Big Lebowski movie quote. Walter delivers the line after a bowler from the opposing team refuses to accept Walter's accusations that he went over the line. Wear this bestselling Big Lebowski t-shirt to pay homage to Vietnam Veteran Walter Sobchak. Combine it with a Big Lebowski bowling shirt (available in the gallery) for the ultimate gift. In addition to the You are Entering a World of Pain tee above, browse the Big Lebowski Clothing Gallery for more apparel like men's and women's clothes, kids shirts or hoodies.